May 5 and 6 Iceland to Helsinki Finland We had a very uneventful leg from Reykjavik to Helsinki. We flew over and over the largest glacier in Europe which is in eastern Iceland, thus “Iceland”. It is quite dramatic and baron. They say it is shrinking 100 kilometers per year. Our on board experts say it has been doing that for thousands of years. It would be interesting to research, but no doubt about it, it is vast. Four hours and change later Bob at PIC and Chris in the right seat squeaked us onto the runway at Helsinki International in a raging crosswind. 30Kts. Bob is still racking up points in the landing department with extra points for difficulty. However, Chris and Jim also have rated perfect tens so far. They won’t let Earl or I give it a shot. Wonder why? 10.5’s might be the new bench mark! So far the camaraderie, facilities, food and arrangements have been the best we could hope for. 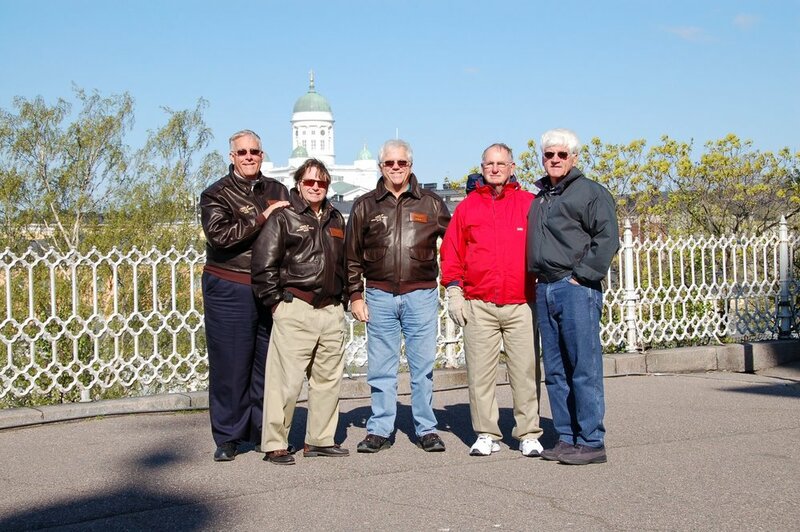 Cool- no- BRISK early this morning in Helsinki, but we had a great tour and got to get some great use out of the tour jackets Mercer provided. The left picture is of the guys enjoying the local open air market with this morning's tour guide, Marja. The bottom one is a picture of us taken from a spot that overlooks the central Lutheran Church you can see in the background. Thanks to all of you that are sending comments, we enjoy every one. Helsinki is a very European city on the water. Lots of walking and bike riding. The old city has low rise buildings and wide boulevards with trees and parks. Everything is just beginning to turn green and people are planting annuals everywhere. 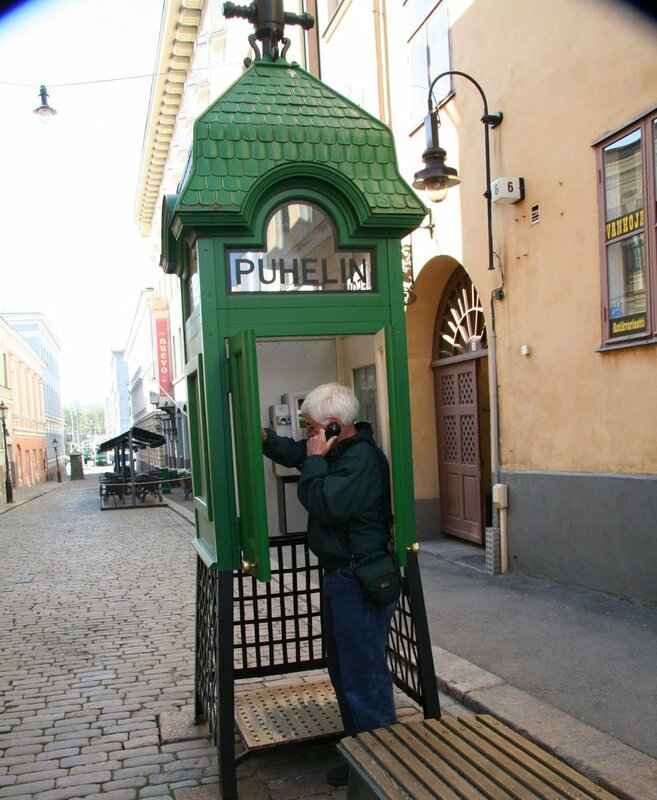 The Finns are just coming out of hibernation and you can tell they are excited. The parks are filled with young people soaking up the sun. It is crystal clear today but if you are in the wind it will get your dentures rattling. Last night we stumbled into what we thought was a little waterside pub. It was, but just behind the very high end pub was a very high end restaurant “Ravintola Nokka”. It was world class, great food, extremely well presented by a wonderful staff. The high tech kitchen was separated from our table by floor to ceiling glass. We could watch it all! After we finished we all walked in to the kitchen and applauded the extremely talented Chef and his two assistants. Today Jim and I had bouillabaisse at a very small soup shop in a covered market. Operated like Sienfield’s Soup Nazi, but very friendly. Jim and I sat at a table after a short wait in line and were soon joined by two women. ………………………………………… Pause for affect. They were two very nice Finnish, married women, who worked in the area. 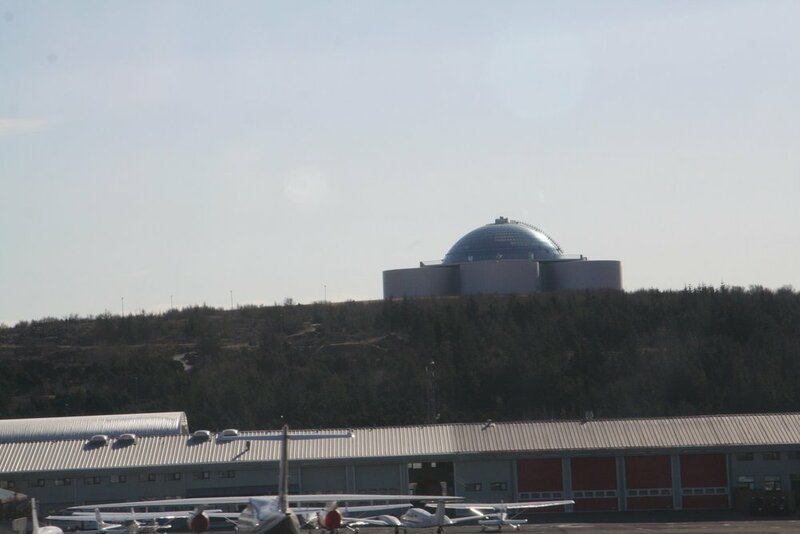 The Perla restaurant on top of geothermal storage tanks. What do you think Jim S.? Great food one more time.